Nearly every day at Growing Power in Chicago, trucks pull up and dump huge piles of discarded fruits, vegetables and loads of wood chips. Growing Power’s farm crews layer these together to create stacks of nitrogen and carbon that heat up and break down to form rich compost. This will become the farm’s vegetable beds. Inside hoop houses (greenhouses built of semi-circular supports and plastic sheeting), smaller piles of steamy compost help keep temperatures above freezing year-round. This allows Growing Power’s urban farmers to produce vegetables even during Chicago’s icy winters. Worms give some of the compost an additional treatment. Their castings enrich vegetable beds and are sold to customers by the bag. You could say that Growing Power is in the business of making soil out of waste, but that is just the beginning. 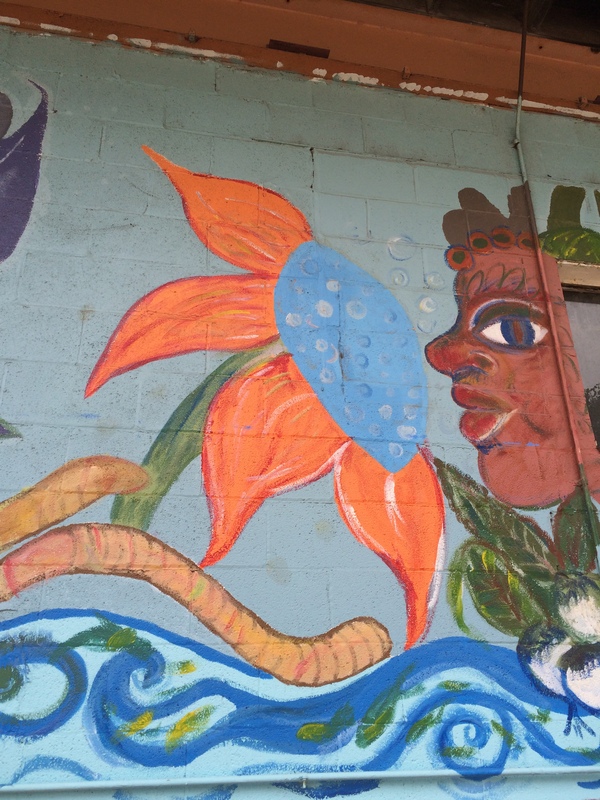 It’s an urban farm, a job training resource, a center for art, healing, and culture, and an oasis in a violent city – a city that is especially violent towards young African Americans. Growing Power is in the business of “making a way out of no way,” as Grace and Jimmy Boggs used to say. The Chicago nonprofit is headed by Erika Allen, daughter of Will Allen, who founded the original Growing Power in Milwaukee, Wisconsin. During a recent gathering of urban agriculture advocates and practitioners, young farmers and trainees explained Growing Power’s system of compost, worm cultivation, aquaponics, and mushroom cultivation to visitors. They also kept conference logistics on track, answered questions from would-be urban farmers from throughout the Midwest, and started on a mural, inviting visitors to add their own images. Their faces shone with enthusiasm and accomplishment. 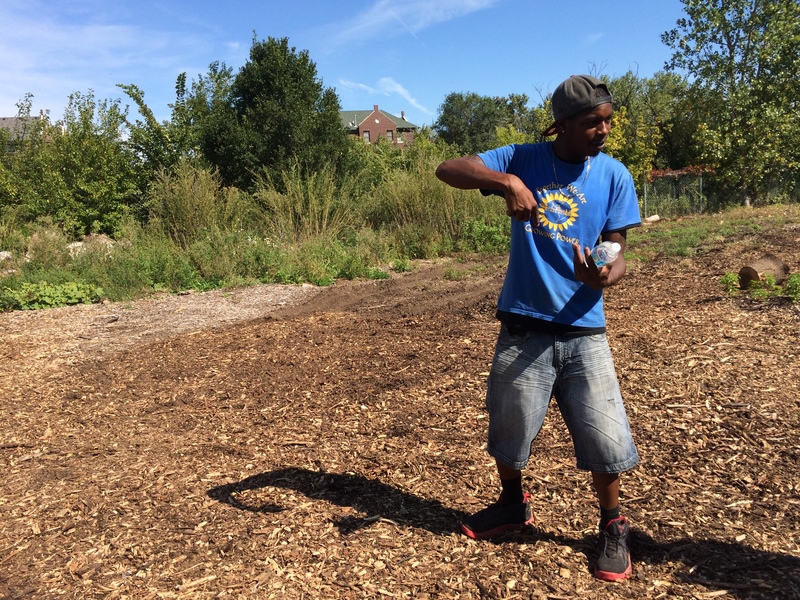 Growing Power has half a dozen sites around Chicago, and is just one of the city’s increasingly sophisticated food justice enterprises. Emmanuel Pratt’s Sweetwater Foundation is another. Sweetwater focuses on aquaponics, closed-loop systems in which fish tanks empty into vegetable beds that draw out nutrients from the fish waste and clean the water before circulating it back to the fish. Like Growing Power, one of the pioneers of this technique, Sweetwater’s aim is to supply both vegetables and fish to customers. And like Growing Power, Sweetwater trains young people in growing food and in managing social enterprises. Food is at the core of a just transition. 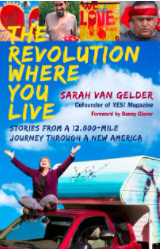 Around the country, people are re-envisioning local economies that can sustain communities and families during a time of climate crises and economic dislocation. This vision of a new economy puts at center those left behind by the old economy, especially young people of color. This new economy isn’t waiting for an endorsement from Wall Street or a bailout from Washington. It’s making a way out of no way; it’s serving up things we all need – like uncontaminated, nutritious food – while offering livelihoods to those formerly dispossessed. During this next phase of my travels, I’ll especially be looking at places where just transitions are making headway. Tyres Walker, a Growing Power farmer, explains composting to visitors at a Growing Food and Justice gathering. 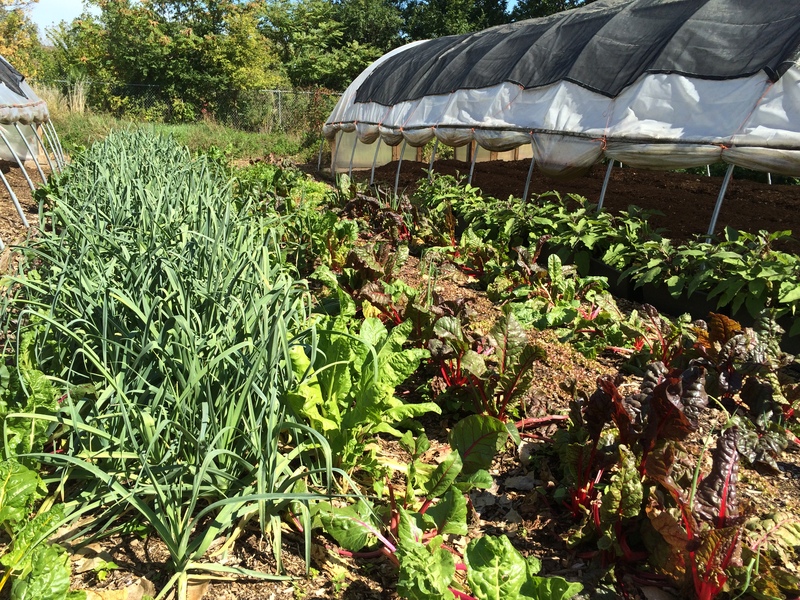 At Growing Power Chicago, veggies are grown both outside and in hoop houses. 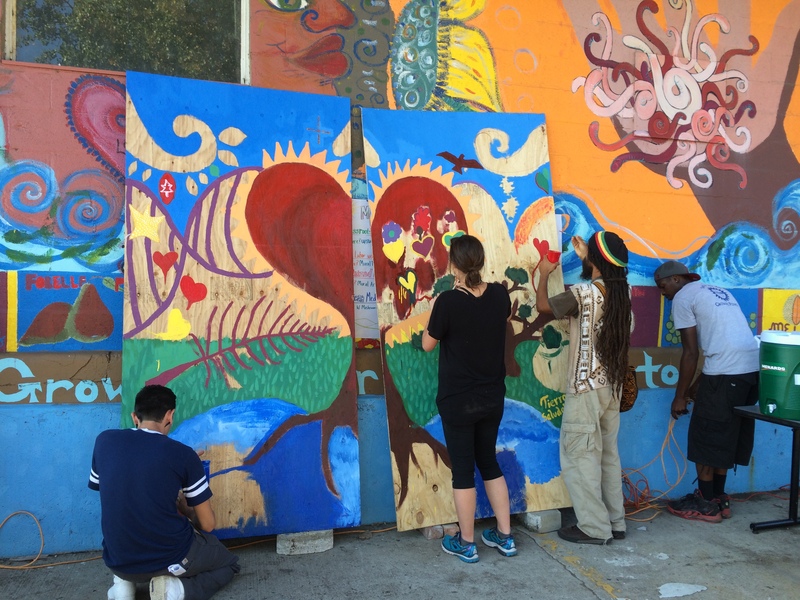 Painters work on a mural at the Growing Food and Justice Gathering in Chicago. 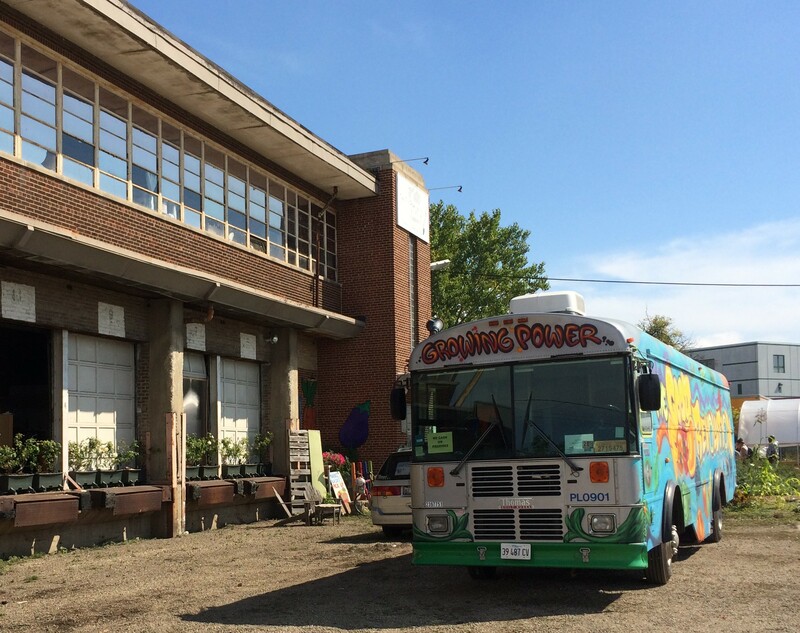 Growing Power buses deliver fresh produce to gathering places in food deserts around Chicago. I enjoyed the piece on food justice work in Chicago. In early September I spent a week on Pine Ridge Reservation in western South Dakota. It’s a classic food desert. It would be the best place for the food justice movement to go to work – helping people establish home gardents, build community gardens, develop the capacity for in food processing and canning, and holding workshops in cooking directly from the garden. The people are great and would be very receptive, but it’d require a sustained commitment. Previous Post New from Chicago and a Question: Where Should I Visit in the Midwest?